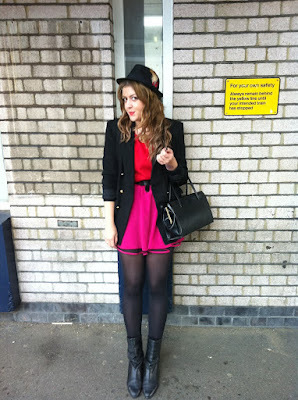 Katy is a super lovely fashion, beauty and lifestyle blogger. She is currently living a champagne lifestyle on lemonade money. For me, her style is quirky, cute and on totally on trend! And like me, is still pretty new to blogging. Today, Katy will be talking about.. Are you in it to win it? So I've been blogging properly for about six months now and have been thinking alot about the whole 'blogsphere'. I recently tweeted (@_katyscarlett) how I wish I had more readers on my blog, not in a popularity contest kind of way. Just in a way, that I would like more interaction with other bloggers and more feedback on my blog to see what people like so I can use it to improve my blog. I noticed that lots of new bloggers are doing giveaways in a bid to gain followers, but are they the followers you really want to attract? The followers that probably won't stick around after the giveaway is finished? Giveaways should be for when you reach a milestone in your blog like reaching 500 followers for example, the type of followers that stuck around even though you content might not be up to scratch sometime. The type of followers that took the time to read the posts you poured your heart and soul into. Those are the type of followers you want to attract and to keep. Which brings me to the point of how do you gain those sort of followers and get them wanting more? I had a few comments from people on twitter in ways to improve your blog, and the main point that struck me is passion. Have you got a real passion that stems from the pit of your stomach? Or are you just in it for the popularity contest? The freebies that 'big' bloggers are sometimes sent? Or the fancy invites to press events? Because if the reason you're blog is any of the last three points, then quit now before you cause yourself any more embarrassment. People can tell when you have passion and that's what gets them coming back for more, hanging on your every written word, admiring every outfit post. I should know, I do it myself! Thanks to the lovely Katy! So what you still on my page for, go and check out hers!